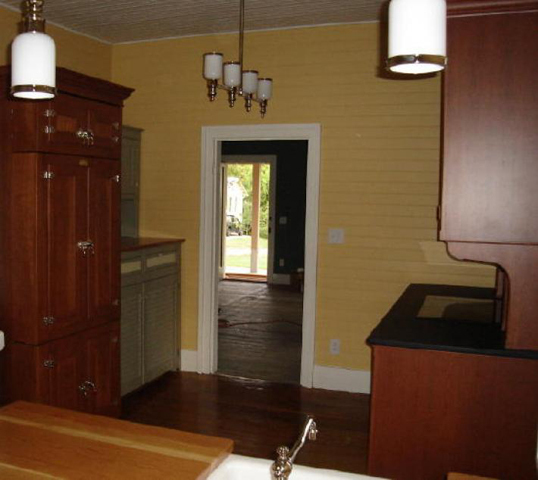 This kitchen is part of a renovation to a cottage in the historic village of Glencoe, NC. Instead of using standard, built-in cabinets with its period compromising exposed appliances, the homeowner chose to hide all the appliances inside beautiful unfitted pieces of Kitchen Workstation Furniture, all except the Ceran cooktop. Even the washer and dryer are concealed in the Faded Green unfitted piece that features louvered doors for ventilation. A standard refrigerator is concealed behind ice box styled doors. The Hampton’ Cherry range safely conceals two ovens and features a slate countertop. The Hampton’s Cherry sink workstation features a solid cherry worktop and a concealed dishwasher. 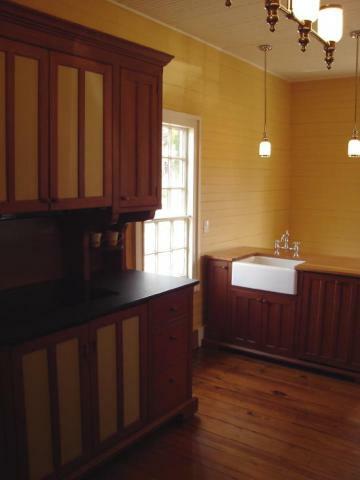 Please click here for more information and images about this unfitted Historic Cottage Kitchen.